Fig Tree of Sadness aka Sleeping with Books. As many of you know, I’ve been trying to figure out my life for some time now. I’m beginning to wonder if trying to figure out one’s life is like trying to fall in love. You can’t make it happen, it just does. Or it just is. Last night I decided instead of boys I am going to sleep with books. So to bed I took my all-time favorite love Gloria Anzaldua, as well as Friedrich Nietzsche, Michel Foucault and The Diaries of Sylvia Plath. I realized the horribleness has been imagined in my own life. For the past year I have had no dreams, no goals, nothing I really wanted except maybe to not want anything. Many people strive for just that, to be content with just being, but I don’t care for it at all. I want to reach for things. I want to achieve, to do things I haven’t done before. To go places. To meet new people. To become better. And maybe that’s the problem. I think that by setting goals and achieving I will eventually become “better,” when really I will always be the same. Maybe not “the same,” but the actual acts aren’t what changes people so much as what is learned along the way. And I don’t need necessarily specific intentions as much as just an openness to learn. Or that’s a theory anyway. Today this very beautiful creature asked me to runaway to South America with him. Yes friends, we’ve met before, it wasn’t some random online dating guy. It’s funny because I woke up really sad, I am still really sad, and it’s weird timing because almost any other day I’d be much closer to saying yes. Today I am just moping. And wondering, if it was my own idea would I be more inclined to do it? Perhaps the problem is that I don’t want to ride on the coattails of another man, even if it’s a good guy with good intentions. Maybe I want it to be a solo excursion or at least a non-romantic one. I told him I couldn’t because of $. He said money is usually a problem but not the problem. So, I guess the problem is me. I don’t know what I want. And making such a drastic life changing decision like quitting my job, moving to a foreign country, basically dropping off the face of the planet–though all seems tempting–isn’t responsible or even a good choice for someone who’s so confused about what she’s doing here on earth as it is. It’s literally running away. And it won’t resolve these issues of sadness and horrible dead dream poverty that I’m going through. Just like a drug, it’s a distraction from the main issue. And when I decide to move to South America or Europe or wherever I decide to move next–I want it to be because I’m ready and willing, but just because I’m scared and confused. So for now, it’s back to my bed full of books. Probably didn’t pick the best options for getting over sad depressing things. Though if you’re going to do it, might as well do it right. 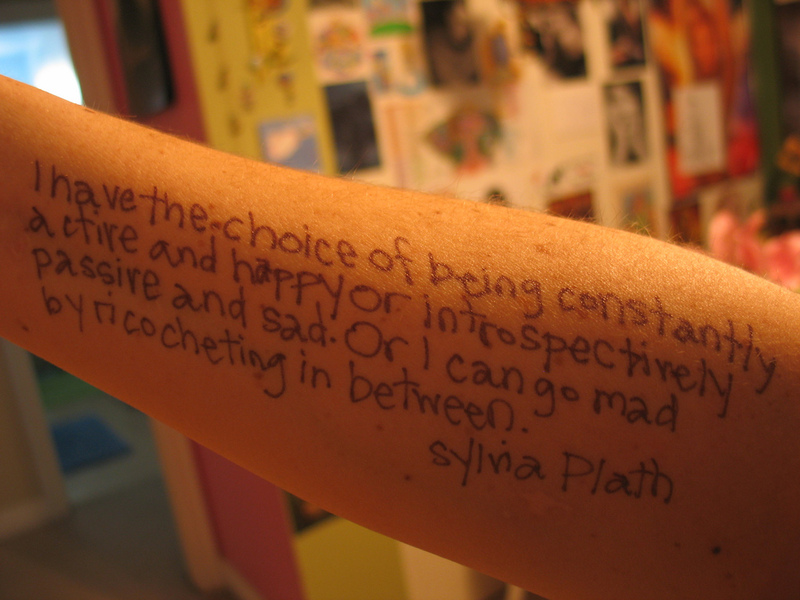 Plath had it down. Maybe I should write some poems. . .